People who know me know that I like to save a buck. I love Groupon and Living Social for that reason. Before they came along, I was using Restaurant.com a lot. I don't like it as much anymore because of the restrictions they have and also because they tell you you have to purchase, say, $35 in food for your $25 coupon to work. Anyway, the point is that I had a coupon for Lounge ON20 that I bought in 2009 and had never used. Lounge ON20 was an ultra-bar that catered more to a club scene than a dining scene. Then last month, when they announced the revamp with Pajo Bruich and Elaine Baker, I jumped for joy. Finally I had a reason to use my coupon! 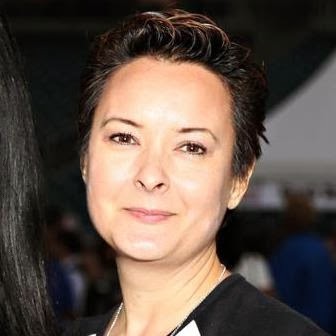 Last week Elaine tweeted that they were going to do a special tasting menu for the weekend. Here was my chance to try a range of items from two chefs that I admire. Keep in mind that they knew I was coming, so this was not a blind tasting (disclaimer). The Lounge has always occupied a large corner of the MARS building. Prior to the revamp the lounge was set mostly with conversation areas of couches and low tables. There was a large empty area for dancing, and then the bar and patio seating. Although there are still some couch areas available, a large section has now been converted to a dining room with booths and tables. My girlfriend and I started at the bar with a drink. As a non-drinker, I'm always happy when I can ask the bartender for a mocktail and they are able to whip up something tasty besides just a spritz of fruit juice and soda water. The bartender made me a mocktail of strawberry lemonade with basil that I found to be nice and refreshing. We were led to the table and presented with the tasting menu and the regular menu. My friend was taken aback by the $75 price on the tasting menu and opted for an entree. I told her she could share some of my items as the tasting menu had eight courses on it - three of which were dessert! Score! We had arrived for 7:30 reservations on a Friday and yet there were only a couple of tables occupied. Our meal did last about two and a half hours and by the end of it the seating was almost full. Guess Lounge still pulls a later crowd, even with the dining revamp. As to our lengthy meal, I did find that the pace was a bit too slow and there were times where we waited quite a while between courses. Considering these are smaller plates and not really filling, I didn't think the pace needed to be that slow for digestion sake. I only noticed one other person doing the tasting menu at the table beside us. This couple had also opted for one tasting menu and one entree. Elaine had said in her tweet that there would only be twelve tastings per night. I mention this because during the course of the meal, it was Pajo himself that brought out each course and explained the elements on the plate. He did this with the other table as well. I did not notice him do so with regular orders. The rest of the time you could see him supervising his staff at the back bar and kitchen. 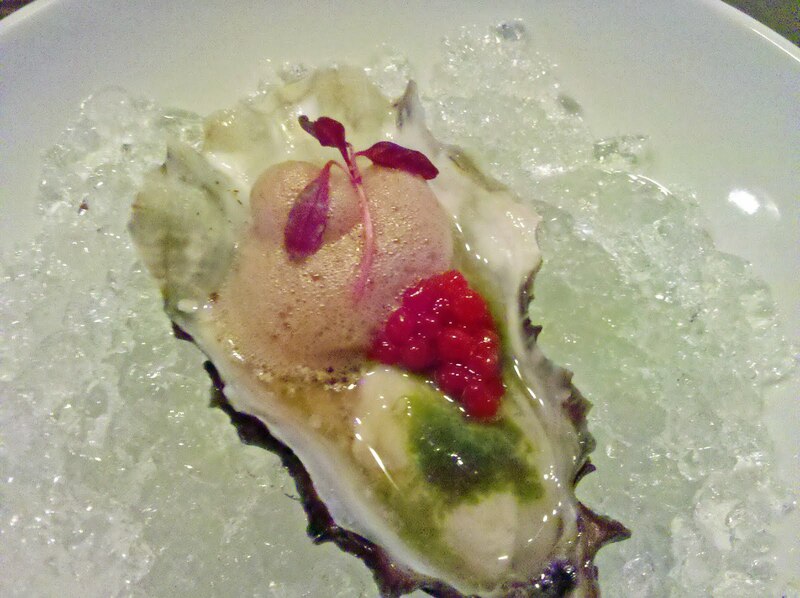 We started off with the oyster. For every course the server did bring us plates for both of us, although we tended to just eat right off the serving plate. In this case, Pajo brought out an oyster for each of us and explained the many components. Thing is with oysters, you slurp them down and they're done. But in that one slurp we got the fresh saltiness of the oyster liquor mixed with so many lightning quick flavors. It seemed such a waste - so much going on that goes by in an instant. Next was hiramasa belly with caviar and frozen droplets of creme fraiche. I've never had sturgeon caviar before. The only fish eggs that I have had are the roe they put on top of sushi. I was apprehensive and then pleasantly surprised. I liked it. It was not as salty as I thought it would be. I really liked the charcuterie plate that was prepared by Chef Mike Ward. 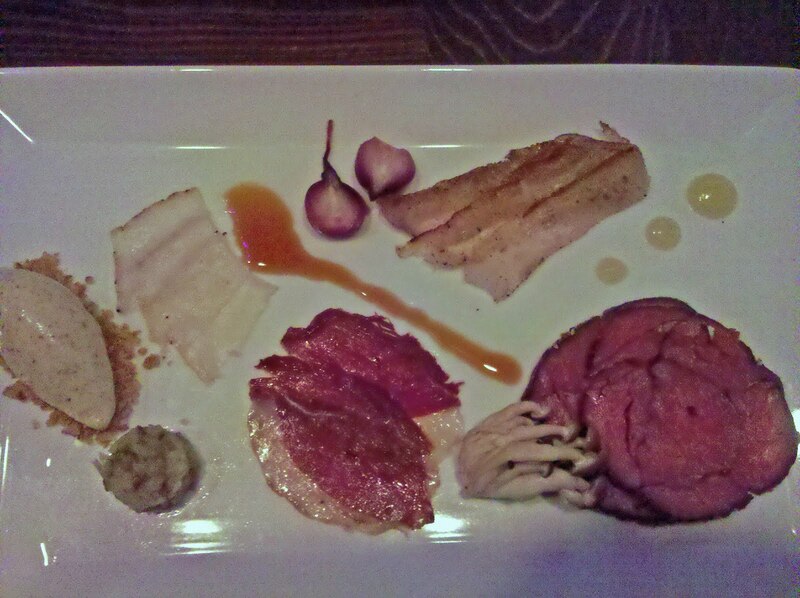 Among the many items were house cured hamachi and lamb pastramis and duck prosciutto. I loved the pastramis, but we were particularly taken with the lamb one because it had lost almost all of the lamb flavor during the curing process. You could have mistaken it for beef. My friend, who loves mustard, was all over the mustard ice cream that was served on the plate. 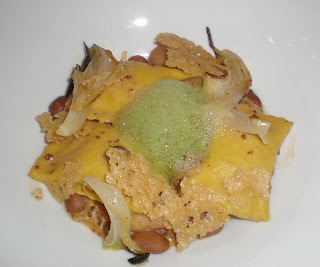 We both fell in love with the spring garlic agnolotti which had housemade ricotta and mascarpone in them as well. It was served on top of a bean ragout and topped with parmesan crisps and a bit of basil foam. This was my first experience with a foam and was delighted with how light and ethereal it was with just the faintest hint of basil. This dish was a favorite and if I had been at The Kitchen, I would have been asking for seconds. 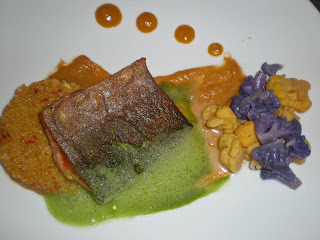 My friend had the Atlantic char that was served with a peanut sauce, curried quinoa, and cauliflower. It also had a bit of the basil foam. We loved how the curried quinoa was handled with a light touch - not too much curry to overwhelm the fish. 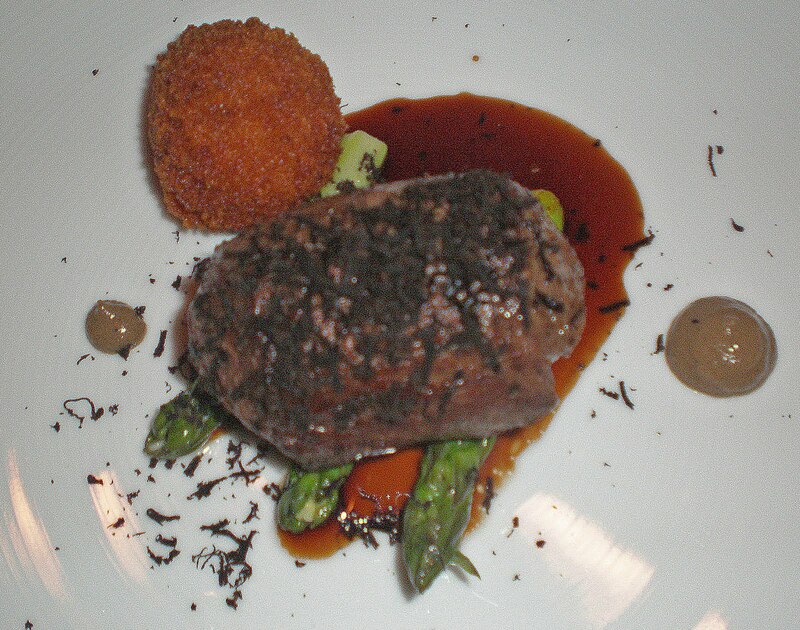 My entree was a Wagyu ribeye cap with asparagus, shaved black truffle, and deep fried bernaise. The beef was cooked sous vide and so pink and tender. As a person who loves medium rare, you can't do better than sous vide to get it done perfectly. But the most memorable thing on the plate was the deep fried bernaise. A frozen ball of sauce crusted with panko and deep fried so that you had a delightful crunch and then it oozed out the melted bernaise. I wished there had been two balls of it. 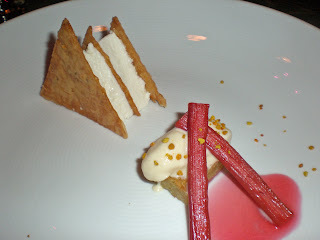 I still believe Elaine Baker is the best restaurant pastry chef in town. She steps it up and creates desserts that are both beautiful and refreshing. No boring creme brulees and cheesecakes from her. Here she has a Napoleon with a sweetened Greek yogurt, a pine nut frangipane, rhubarb and honey ice cream sprinkled with bee pollen. We liked the light sweetness of the yogurt that made it taste closer to creme fraiche than yogurt. I love frangipane and wished there had been a bigger piece of that. I was thrilled that we got more than one dessert. Next was a black forest cake rich with Valrhona chocolate. Beside it were some cooked cherries and a luxardo pastry cream. The final sweet treat was a pair of palmier cookies that had been dipped in sugared bacon grease to give them a crisp, salty coating. The meal was excellent with something that stood out in each course. Pajo brings something new to Sacramento diners and Elaine returns in a venue that pairs her creative pastries with a creative kitchen. If you are looking for something outstanding and different from the usual fare, then make a visit to Lounge ON20 and enjoy the change.